The wind off Lake Erie was blowing in our faces, putting a severe arc in the lines. It was tough to feel what was happening at the baits. At first, Matt Bichanich tried angling the boat into the blow, but that didn’t make things any better. Even though light jigs and grubs had worked spectacularly the two previous days, now, we had to go with something heavier for the prespawn smallmouth of Presque Isle Bay. The bass were moving progressively towards shallow water, coming in from their deep winter haunts. First, they showed up in the channel that separates Lake Erie from the mammoth bay. Schools of smallmouth staged around the artificial walls, and then they moved farther into the bay where they spread out. When we found smallies, we didn’t catch just one or two. We caught dozens in tight, structure-oriented water. I’ve seen similar movement of prespawn smallmouth in a number of other bays that also front the Great Lakes. Other places, the bass migrate into shallower shorelines on the main lake itself. Whether it’s one or the other, the passage towards select spawning areas is an annual occurrence, and anglers can expect similar activity in other large, natural lakes with solid populations of smallmouth bass. Fishing this prespawn migration often results in some of the biggest bass of the year. Bichanich and I barely sneezed at four-pounders. Imagine that. While the weather cooperated, 1/8-ounce jigs in 5 to 7 feet of water had worked beautifully, but with high pressure and a front moving in, the bass had stutter stepped to a little deeper water, and there was that wind. Eighth-ounce jigs flutter and fall fairly slowly through the water column, giving bass plenty of time to react, even when the fish are a little slowed by 50-degree April water. While a 1/4-ounce might not seem like a lot more weight, changing to the heavier jig may change the presentation dramatically. A heavier weight usually drops more rapidly, with less of that enticing swaying action. That’s two strikes against adding weight. Yet you can do things to mitigate the weighty negatives, and best is to change the style of jighead. Bichanich handed me a bulky 1/4-ounce Bass Stalker Spot Stalker jig. This jig has a sharply angled front, resembling the tip on a pair of needle-nose pliers. In addition, the bottom has a dimple that increases water resistance on the fall. Bichanich assured me the shape and the indentation at the base would slow the fall rate and also impart some swaying action as it descended. To further slow the descent, he added a bulky 5-inch twister-tail. The wind blew just as hard, but with the heavier jig, the line was not as arced, and casts went straighter. The breeze still lifted the line a bit, but I could feel the bottom—and the tick of a bite. Low-trajectory side-arm casts fly farther into or across wind. If you keep casts under the wind this way, you may also achieve greater accuracy. In addition, the line settles to the water more quickly, and that can be very helpful. Feeling a pickup as a bait descends on a loose line may be difficult if not impossible. To catch prespawn bass, you want to keep the bait close to bottom, gliding slowly over structure, and in cold water, a fitful hop is not appreciated by the fish. I’ve tried simply raising and lowering the rod tip to produce a slow bounding action, but a slow, steady retrieve works best. Either the wind or the current can work against this presentation. Daily and sometimes hourly adjustments to ever-changing current and wind are often necessary. 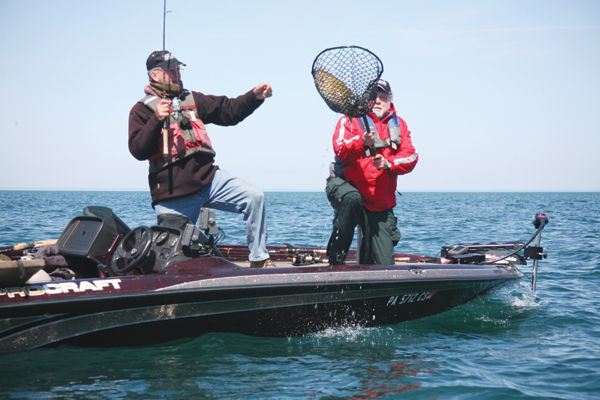 While 10- or 12-pound-test line may be reassuring when battling a 6-pound smallmouth, such strength is not truly needed in open-water, and the bulk of such line can work against the presentation. I prefer 8- or even 6-pound test. We used Seaguar 8-pound InvizX fluorocarbon for these bass, getting the benefits of thin diameter and near invisibility. With this light line, back-reeling can be a real line-and-knot saver. To back-reel, the anti-reverse on a spinning reel is clicked off, and the drag is set at a moderate, certainly not a tight, pull. When a big smallie runs, the angler turns the reel handle backwards, releasing line to help the drag keep up with the speed of the fish. Working from the front of the boat, Bichanich proved to be a master of this technique, and it garnered him a number of large fish. Of course, finding the right structure is most critical to bass fishing, prespawn or otherwise. And the types of structure available to prespawn smallmouths are limited compared to what will be available in a month or two. Weeds just don’t come into play yet. Neither does woody cover to any large degree. Locating open-water migration routes is the ticket, and keying on rock piles, humps, sandbars, channels and in some cases creek and secondary bay entrances unlocks the door. Incidental structures like buoys and sunken boats can be real honey holes. In front of Buffalo, New York, the remains of a sunken barge provide one of the best places to intercept migrating smallmouth bass. Talk about five- and six-pounders. Many of these big-lake spawning bays have substantial sand or rock bars near the channels that lead from the main lake to the more sheltered waters, and these bars are an excellent starting area. Underwater humps are another. 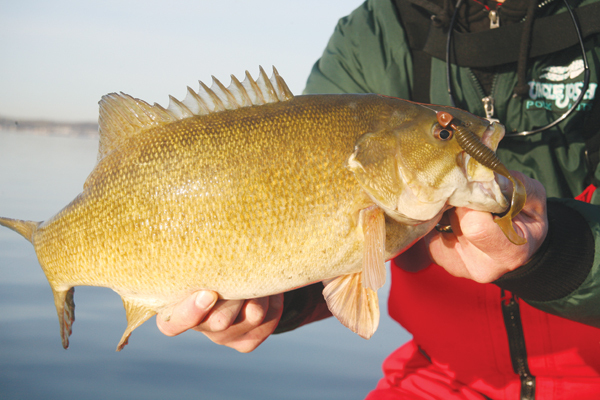 In both locations, smallmouths face into the current or wind, whichever is more substantial. This positioning dictates how the jig should be worked, which I’ll detail shortly. The problem for anglers is that prespawn bass are nearly always on the move. Where you caught them yesterday may be devoid of fish today. In the channel mouth at Presque Isle Bay, we loaded up on bass at the corner of a metal wall. The next morning, not a single fish could be taken from that spot. However, we found a school about 300 yards away on top and beside the bar that runs against the entrance channel. Other anglers reported a fair bite at the metal wall the following afternoon, a bite that was said to rev up even more the following morning. It was widely agreed that the bass had returned to the structure, but I silently disagreed with this assessment. Anglers often believe migrating bass have returned to a structure. Not necessarily so. What more likely occurs is that another wave of different bass moves in following the same route. When a hot structure turns cold, the migrating bass have gone on to the next good cover. From there, they find yet another piece of structure to their liking. They don’t backtrack. Locations blow hot and cold because the fish do not move in one giant, all-encompassing wave. A large pod may come along soon after the first pod leaves. The stopping points get hot, grow cold, and get hot again, especially when water temperature holds steady. Eventually, the waves all pass. Until that time, however, it pays to work the route from start to finish, because you never know where the next wave may be. More often than not, structure-oriented bass will be facing into current or wind. However, this doesn’t mean they’re all finning straight into the flow like a bunch of salmon headed upstream. Instead, the bass find obstructions or breaks that enable them to hold out of the direct flow. Where sand or mud humps look like low regular-spaced ridges, the fish may just sit in the valleys between the hills. The bass do not all face the same direction, because the flow is not the same everywhere. Nevertheless, it’s important to bring the jig into their faces, something most dependably accomplished by casting into current or wind, allowing the bait to settle to bottom, and then reeling back slowly. A curly or twist tail grub can hold a lot of advantages in this situation. With those 5-inch curly tails, Bichanich and I were able to get good but not overly aggressive action by simply retrieving with the flow. While a paddle-tail grub is often touted for such circumstances, when slow reeling is a necessity, a twister tail may present just enough movement at the right speed to trigger the bass. Two new Kalin’s colors, Dirty Avocado and Apple Juice, were particularly hot on the Presque Isle trip and on a follow-up trip to another clear-water location off Lake Michigan. Teamed with brown Spot Stalker jigs, it seemed a perfect mimic for the smallmouth’s spring forage. We fished them on sensitive 7-foot medium-action Denali Shaky Head rods, model 843 SH. A tick or two was all we felt with most strikes, even from 6-pounders. Raise the rod tip sharply, pull to the side to gain even more line, and set the hook. After that, the battle is on.